The Department of Labor’s 2016 Final Rule updated a critical labor standard for working families.2 The core provision of the 2016 rule was to increase the salary threshold under which most salaried workers are eligible for overtime pay when they work more than 40 hours per week from $455 per week ($23,660 for a full-year worker) to $913 per week ($47, 476 for a full-year worker), the latter being the 40th percentile of the earnings of full-time salaried workers in the lowest-wage Census Region, currently the South. Further, the rule provides that the threshold would be updated every three years to the 40th percentile of the earnings of full-time salaried workers in the lowest-wage Census Region, in order that the threshold does not continually erode over time as the wage distribution rises. The 2016 rule was critically needed because the threshold had been allowed to erode dramatically. In 1975, the threshold was at a level such that nearly half of all salaried workers earned less than the threshold (and were thus eligible for overtime), but by 2014, that share had eroded to less than 10 percent.3 The erosion in the threshold was due to two key factors: (1) the threshold was updated only once since 1975, generating, as wages rose throughout the economy, a growing share of exempt workers who should have been overtime eligible, and (2) the last update in 2004 was fatally flawed, due to (as described below) a mismatch between the salary threshold and the duties test, meaning that even in 2004 the 2004 rule resulted in a large share of exempt workers who should have been overtime eligible. The 2016 rule provided new or strengthened overtime protections to roughly 13 million workers, correcting to a large extent for these two sources of erosion in the threshold.4 The rule will also increase employment by spreading work. The 2016 Final Rule was the result of an exhaustive, more than two-year rulemaking process. During this process, the Department met with over 200 organizations, including “employees, employers, business associations, non-profit organizations, employee advocates, unions, state and local government representatives, tribal representatives, and small businesses.”5 The Department also received and reviewed over a quarter million public comments. In the Final Rule, the Department responded comprehensively to those comments and conducted a thorough economic impact analysis incorporating that input, along with a careful review of the academic literature. We strongly oppose any efforts to weaken the painstakingly determined criteria set forth in the 2016 Final Rule for defining who qualifies for exemption from overtime protections. In particular, the Department must not revert to the methodology used in the 2004 rulemaking. As mentioned above, the methodology of the 2004 rule was fundamentally flawed. Prior to the 2004 rule, there were two sets of tests, each of which involved a duties test and a salary test. The duties test and salary test within each set had always worked together.6 One set was the “long test” set, which combined a strict duties test with a lower salary threshold. The other was the “short test” set, which combined a more lenient duties test with a higher salary threshold. Thus an employer who wanted to assert that a relatively low-paid employee was exempt had to show more rigorously that their duties were “bona fide executive, administrative, or professional” in nature, whereas for a more highly paid employee the employer did not have to make as rigorous of a showing. In the 2004 rule, the Department included just one set of tests. For this set of tests, they created a “standard” duties test that was based on the more lenient “short test.” To remain consistent with the prior methodology, the Department should have paired this duties test with a higher salary threshold consistent with a short duties test. Instead, they used a lower salary level consistent with a long duties test.7 This was a fundamental error. As a result of the mismatch in the 2004 rule, neither the methodology nor the salary threshold from the 2004 rule are meaningful or appropriate benchmarks for future rulemaking. The 2016 rule corrected this error by retaining the same duties test that was used in the 2004 rule, but correctly pairing it with a higher salary level consistent with a short duties test. Our responses to the specific questions in the RFI follow. Question 1: In 2004 the Department set the standard salary level at $455 per week, which excluded from the exemption roughly the bottom 20 percent of salaried employees in the South and in the retail industry. Would updating the 2004 salary level for inflation be an appropriate basis for setting the standard salary level and, if so, what measure of inflation should be used? As mentioned in the introduction, neither the methodology nor the salary threshold from the 2004 rule are meaningful or appropriate benchmarks for future rulemaking due to the mismatch in the 2004 rule between the duties test and the salary threshold. One predicable result of this mismatch is the misclassification of hundreds of thousands of overtime-eligible employees as exempt. The Department estimates that there are nearly three-quarters of a million (732,000) white collar salaried workers who earn between the 2004 threshold and the 2016 threshold who are overtime-eligible based on their duties but whose employers do not recognize them as such.8 If the Department were to use the 2004 methodology or salary threshold as a benchmark, it would be intentionally adopting an approach that would subject hundreds of thousands of workers to wage theft. In addition to the harm this would cause misclassified workers, this would increase the Department’s enforcement burden. Because the Department erred in 2004 and paired a less-rigorous duties test with a low salary threshold, the only way the 2004 salary threshold could be used as a benchmark would be if the Department were to strengthen the duties test to align with the historic long test and account for Congress’s intent that only bona fide executive, administrative, and professional employees be exempt from overtime pay. The Department notes “Because the long [emphasis added] duties test included a limit on the amount of nonexempt work that could be performed, it could be paired with a low salary that excluded few employees performing EAP duties.”9 This is further discussed in our response to Question 4. If the Department were to use the 2004 salary level methodology paired with a rigorous/long duties test, it is important to note that the 2004 salary level should not be adjusted according to inflation, but according to changes in the wage distribution. This is further discussed in our response to Question 11. Question 2: Should the regulations contain multiple standard salary levels? The Department has always used a single salary level across all employers and geographic areas, establishing a national floor, and should continue doing so. The 2016 rule dealt with the issue of wage variation by basing the national salary level on earnings in the lowest wage Census region. This approach avoids making too many bona fide EAP workers in low-wage areas overtime eligible while maintaining a uniform salary level. Accounting for regional variation would thus, essentially by definition, have the effect of raising the threshold in all regions except the South. The 2004 final rule noted that using multiple salary levels is not “administratively feasible.”10 However the segmentation would be determined (i.e. by type of employer, industry, geographic area, etc), the classification of employers between the different salary levels would be administratively burdensome for the Department and add to compliance costs for employers, particularly for (but not limited to) companies that would operate under more than one salary level (e.g. companies with establishments in more than one region). Further, close calls between different salary levels would be likely to generate litigation. A national floor promotes clarity while multiple salary levels would add needless complexity and burden. Question 3: Should the Department set different standard salary levels for the executive, administrative and professional exemptions as it did prior to 2004 and, if so, should there be a lower salary for executive and administrative employees as was done from 1963 until the 2004 rulemaking? The Department has always used a single salary level across the executive, administrative, and professional exemptions for the short-test salary level, which is what the standard salary test is based on. It should continue to do so. The three categories (executive, administrative, and professional) are difficult to distinguish between; in many occupations, employees may be covered by more than one definition. Any attempt to distinguish between them would require a substantially more rigorous duties test for each exemption than the current standard duties test. As with setting different salary levels based on geography or employer type, using different salary levels for different exemptions would add needless administrative burdens for the Department, compliance costs for employers, and an increased litigation risk. Question 4: In the 2016 Final Rule the Department discussed in detail the pre-2004 long and short test salary levels. To be an effective measure for determining exemption status, should the standard salary level be set within the historical range of the short test salary level, at the long test salary level, between the short and long test salary levels, or should it be based on some other methodology? It would be arbitrary and capricious to return to the mismatch of the 2004 rule; the “inverse correlation” between the salary threshold and the duties test that was restored in the 2016 rule must be preserved. The pairing of the standard—essentially the short—duties test with a relatively high salary threshold, as was done in the 2016 rule, is the preferred way to achieve the match. Because the salary threshold is simple, objective, and predictable, this pairing reduces both compliance costs and litigation. Assuming the Department maintains the standard duties test, the salary level must then be set within the historical range of the short test salary level in order to maintain an appropriate match between the duties test and the salary test. There are two main choices for determining the appropriate salary level, the “Kantor” method, used from 1958 through 2004, and the method used in the 2016 rule (as mentioned, the 2004 method is inappropriate). The Kantor method involves two stages, calculating first what the long-test salary level would be and then multiplying that by somewhere between 130 percent and 180 percent to arrive at the short-test salary level.11 (Note, a two-stage approach made sense prior to 2004, when there were two sets of tests to determine exemption.) A core problem with the Kantor method is that the first step depends on extensive data analysis to update.12 In contrast, the method in the 2016 final rule is straightforward, taken directly from a series that is published on a quarterly basis by the Bureau of Labor Statistics.13 The transparency of this 2016 approach is preferable because it means that employers and employees alike can plan for future updates with a high degree of certainty. The economic analysis in the 2016 rule shows that the Kantor long test method resulted in long-test salary threshold of $684.14 Thus, 130 percent to 180 percent of that long-test level yields a range of $889-$1231 for the salary level consistent with the standard duties test. At $913, the 2016 salary level was within, but at the very low end of, the historical range of the short test. This means that anything meaningfully lower than the 2016 salary level would require a more rigorous duties test. Question 5: Does the standard salary level set in the 2016 Final Rule work effectively with the standard duties test or, instead, does it in effect eclipse the role of the duties test in determining exemption status? The duties test remains important for determining exempt status at all plausible salary thresholds. 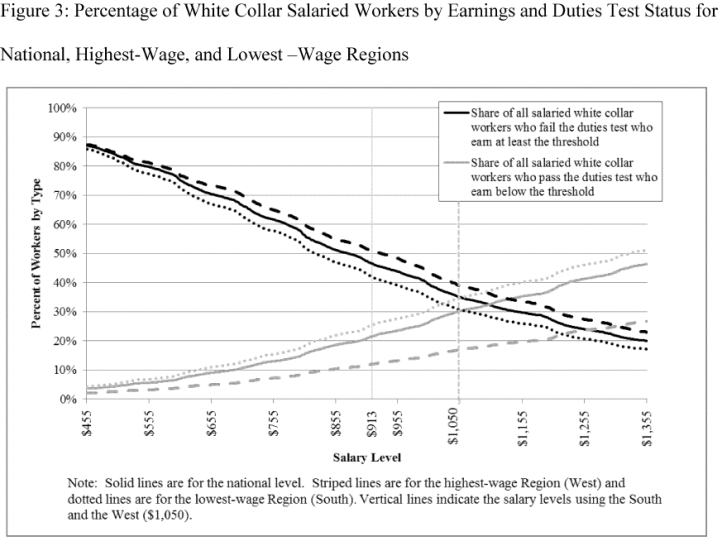 For example, the figure also shows that more than 30 percent of white collar salaried workers who fail the duties test earn above $1,100 per week, the highest alternative considered in the 2016 Final Rule,16 and more than 20 percent of white collar salaried workers who fail the duties test earn above $1,300 per week, or $67,600 for a full-year worker. Lowering the threshold in the interest of not “eclipsing” the duties test would solve a problem that the Department’s own analysis shows does not exist, and in so doing would knowingly expose a greater number of lower-earning salaried workers to wage theft (which, as our response in Question 1 shows, is the predictable outcome of a low salary threshold paired with the standard duties test). Question 6: To what extent did employers, in anticipation of the 2016 Final Rule’s effective date on December 1, 2016, increase salaries of exempt employees in order to retain their exempt status, decrease newly non-exempt employees’ hours or change their implicit hourly rates so that the total amount paid would remain the same, convert worker pay from salaries to hourly wages, or make changes to workplace policies either to limit employee flexibility to work after normal work hours or to track work performed during those times? The Department undertook an extensive, exhaustive outreach program involving compliance assistance and education to stakeholders and employers across the country, including business and small business, non-profit organizations, state and local government, and higher education institutions. The Wage & Hour Division reported conducting over 200 outreach events through District Offices. The National office hosted multiple public web presentations on the Final Rule, implementation, and the Fair Labor Standards Act with tens of thousands of participants. The Department acknowledged repeatedly in the plethora of guidance materials produced that employers had multiple ways to comply with and implement the rule, at their discretion, based on the needs of their workforce and the situations of their employees. In November 2016, the Department was enjoined from implementing and enforcing the overtime rule. It is not difficult to suppose that had the Department been permitted to continue conducting outreach, providing technical assistance, and educating the regulated community about the effects of the rule, that even more employers would have continued to do so. Many employers and workers alike shared that the late date of the preliminary injunction so close to the rule’s effective date caused both legal and financial uncertainty for them, as salary increases and overtime eligibility statuses were held in the balance. Despite this, many employers announced that they would maintain the already-promised or established changes. There has not been substantial evidence that employers reversed course on implemented changes en masse, nor that employers that implemented changes suffered financial or managerial difficulties. In fact, some employers cited that complying with the Final Rule aligned with their goals of attracting and retaining valuable employees, or that the process of implementation revealed other inefficiencies or misclassifications among their workforce that they could now address. Question 7: Would a test for exemption that relies solely on the duties performed by the employee without regard to the amount of salary paid by the employer be preferable to the current standard test? Both workers and employers need the objectivity, simplicity, and predictability of the salary test. As the above quote suggests, getting rid of the salary test would demand a dramatically more rigorous duties test to maintain the “inverse correlation” between the duties test and the salary test (which would essentially be lowered to zero). This would greatly complicate the application of the exemption, increasing compliance costs for employers. It would also increase the enforcement burden for the Department, given that getting rid of the bright-line salary test would expose many more workers to misclassification (see our response to Question 1 for more discussion of misclassification in the context of a misalignment between the salary test and the duties test). Question 8: Does the salary level set in the 2016 Final Rule exclude from exemption particular occupations that have traditionally been covered by the exemption and, if so, what are those occupations? There are a total of 36.12 million salaried workers nationwide in occupations that are potentially affected by the salary threshold. The attached table shows that there are 94 white collar occupations, representing 7.45 million workers, where less than 20 percent of workers are exempt. In 81 of those occupations, representing a total of 5.86 million workers, 6 percent or fewer of salaried workers are exempt under the 2016 threshold; but in all of those occupations, 7 percent or fewer are exempt under the 2004 threshold as well. Moreover, in only one of the remaining 13 occupations would more than 50 percent of workers have been exempt under the 2004 threshold – actors. There are a total of 11,400 actors, making up well under one-tenth of one percent (0.03 percent) of all salaried white collar workers. To summarize: this analysis shows that less than one-tenth of one percent of all white collar salaried workers are in occupations that meet even extremely lax definitions of “excluded from exemption” and “traditionally covered by the exemption.” It is also worth noting there is a very high and statistically significant correlation (r=.977) between the percentage of an occupation that is exempt under the 2004 threshold and the 2016 threshold. This suggests that the 2016 rule is highly consistent with exemption status under the prior rule. Question 9: The 2016 Final Rule for the first time permitted non-discretionary bonuses and incentive payments (including commissions) to satisfy up to 10 percent of the standard salary level. Is this an appropriate limit or should the regulations feature a different percentage cap? The 10 percent cap meets the dual goals of modernizing the rule in light of evolving business practices while not generating undue income volatility for exempt workers who receive nondiscretionary bonuses but whose fixed predetermined salary is below the standard salary threshold. EAP exempt employees who are affected by the bonus allowance are, by definition, those with the lowest fixed predetermined salary. Under the 2016 salary level, they are EAP exempt workers who have fixed predetermined earnings between $821.70 per week—90 percent of $913—and $913 (between $42,728 and $47,476 for full-year workers). If the bonus allowance were increased, it would affect only workers with even lower fixed predetermined earnings. For example, if the bonus allowance were increased to 20 percent, the increase would affect workers who have fixed predetermined earnings between $730.40—80 percent of $913—and $821.70 (between $37,981 and $42,728 for full-year workers). As the EAP exempt workers with the lowest fixed incomes, they would likely be least able to absorb without hardship the larger potential income swings associated with a higher bonus allowance. Importantly, this would likely disproportionately affect racial and ethnic minorities and women due to the fact that of EAP exempt workers, racial and ethnic minorities and women are more likely to earn at the low end of the earnings scale.26 Of course, if the standard salary test were reduced, all of the above numbers would shift down accordingly, meaning that the bonus allowance—and the potential income volatility that comes with it—would affect EAP exempt workers with even lower fixed predetermined incomes who would be even less able to absorb those fluctuations without added hardship. Further, the Department noted in the 2016 rule that “We believe that a 10 percent limit is also appropriate given that we are including nondiscretionary bonuses, incentive payments, and commissions as part of the salary level test for the first time and the full impact of this change on determination of EAP status is not yet known.”27 Given the lack of additional experience with the change since the Department made that statement, it would be arbitrary and capricious for the Department to increase the cap. Question 10: Should there be multiple total annual compensation levels for the highly compensated employee exemption? A very small share of workers who are exempt from overtime protections are exempt as a result of the highly compensated exemption alone. For example, the analysis of the 2016 Final Rule shows that just 1.5 percent of workers who gained new protections (65,000 out of 4.228 million) passed the highly compensated duties test but not the standard duties test.28 Thus, the highly compensated exemption provides little more than needless complexity, and should be eliminated or, at the very least, kept as simple as possible, using the same basic approach as is used in setting the standard salary threshold. As described in our response to Questions 2 and 3, above, introducing multiple tests would introduce needless administrative burdens for the Department, compliance costs for employers, and an increased litigation risk. Question 11: Should the standard salary level and the highly compensated employee total annual compensation level be automatically updated on a periodic basis to ensure that they remain effective, in combination with their respective duties tests, at identifying exempt employees? The salary levels should be automatically updated on a periodic basis. Before the 2016 rulemaking, the threshold hadn’t been updated since 2004, and before that, not since 1975. As a result, during the long stretches when the threshold remained unchanged, it steadily eroded as an effective test for determining which white-collar employees are exempt. Automatic updating solves this problem. Automatic updating should be done in a way that precisely maintains the standard. The 2016 final rule achieves this by updating the threshold on a periodic basis to the 40th percentile of earnings of full-time salaried workers in the lowest-wage Census region. This general approach ensures that the standard laid out in a final rule would be preserved – neither strengthened nor weakened. In other words, automatic updating in this way simply preserves the status quo. Updating based on any other basis, such as with a measure of price inflation, is inappropriate because—except in the highly unlikely case where prices grow at exactly the same pace as the benchmark used to set the salary level—the threshold would become misaligned over time. Importantly, it would be unnecessary and unworkable for the Department to do more frequent rulemaking instead of automatic updating. Rulemaking is extremely time and resource-intensive and it doesn’t make sense to continually devote limited resources to maintain the status quo in a regulation when it can be done automatically. Notice and comment rulemaking should be reserved for when policymakers want to change the substance of the rule. Automatic updating provides crucial predictability. The transparency of the 2016 approach — in which the benchmark series is published on a quarterly basis by the Bureau of Labor Statistics29—is advisable because it means that employers and employees alike can plan for future updates with a high degree of certainty. Updating should occur no farther apart than every three years, with one year being optimal, to reduce the degree of erosion between updates. 24. 81 Fed. Reg. at 32422.